TechniTrader teaches "Common Candlestick Stock Gaps"
Many Retail Traders really enjoy trading gaps because of the higher point gains that come quickly. But in order to reap the gains from a gap you must be in the stock PRIOR to the gap. Chasing a gapping stock or trying to buy a stock that has gapped and is running, is a much higher risk. The reason is because often the giant institutions have already bought the stock weeks ago aware of the news that was coming, and are planning on selling as the news reaches you, the Retail Trader. TechniTrader is "The Gold Standard in Stock Market Education." 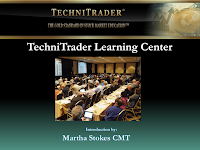 Go to the TechniTrader.com Learning Center and watch the How to Trade the Stock Market Webinar, to experience for yourself the excellence of TechniTrader education. Your goal should be to always be in a stock before the gap occurs rather than trying to rush and chase the crowd. By being in early, you will be trading with the Institutional Traders rather than against them. A smaller cap stock with fewer outstanding shares than most big blue chips, and big popular stocks will gap. The fewer outstanding shares the more likely a stock will gap especially on news, since there is a limited number of shares available to trade. The candlestick chart example below shows common candlestick stock gaps, which are indicated by the red arrows. Common gaps are caused by overnight order flow of Market Orders and by Limit Orders. Both types of orders should NOT be used because they expose the retail trader to the risk of a common gap as well as the risk of a poor fill. Limit Orders can get the retail trader into a stock that is moving down or against the direction they want the stock to move, which is a bad idea. Common gaps nearly always fill, which means that the stock price will move in the opposite direction, of the original price move that caused the gap. So if a stock has a common gap that moves price up, in a few days price will move down and “fill” the gap before resuming its intended path. TechniTrader is "The Gold Standard in Stock Market Education." Go to the TechniTrader.com Learning Center and watch The Basics of the Stock Market for New Investors and Beginning Traders Webinar Lessons, to experience for yourself the excellence of TechniTrader education. Gaps that are common are usually filled by intraday or short-term Traders taking profit quickly. So always be aware when a common gap has occurred and you can avoid many untimely entries. The two green arrows point to the last gap in this candlestick chart example, which is NOT a common gap nor is it a breakaway gap. Breakaways are strictly a gap that jumps completely over and above resistance. This gap did not jump over resistance completely. Understanding gaps is critical to consistent success as a Retail Trader regardless of whether you want to Day, Swing, Momentum, or Position Trade. You must know what a gap means for near term price action, so that you can make correct decisions when you are in a gapping stock, and also so that you can enter stocks prior to gaps of this kind.